With the reports feature of SalesAutopilot you can track how many emails were sent with which delivery schedules on a daily, weekly, or monthly basis. This allows you to get a quick overview of the emails that were sent over a given period, which helps you save a significant amount of time. When do SalesAutopilot reports help me? When you want to make sure your delivery schedules were set up properly, and thus your emails were delivered. When you want to see trends in your email marketing at a glance. When you optimize your budget and you want to keep track of how many emails were sent. When you have set up semi-automated processes with SalesAutopilot and you want to know exactly which subscribers need to be helped manually to continue moving through the process (e.g. phone call to a newsletter subscriber, sending snail mail, etc.). Daily reports include the total number of subscribers in all of your lists from the previous day along with every email sent that day, grouped by email and delivery schedule. SalesAutopilot collects the data at 8 a.m. and sends you the report in the morning. The weekly report will be sent to you every Monday morning, and will include data from the previous week. The monthly report will be sent to you on the first day of every month, and will include data from previous month. In the tree menu, go to Settings, open the System folder, and select the Reports option. 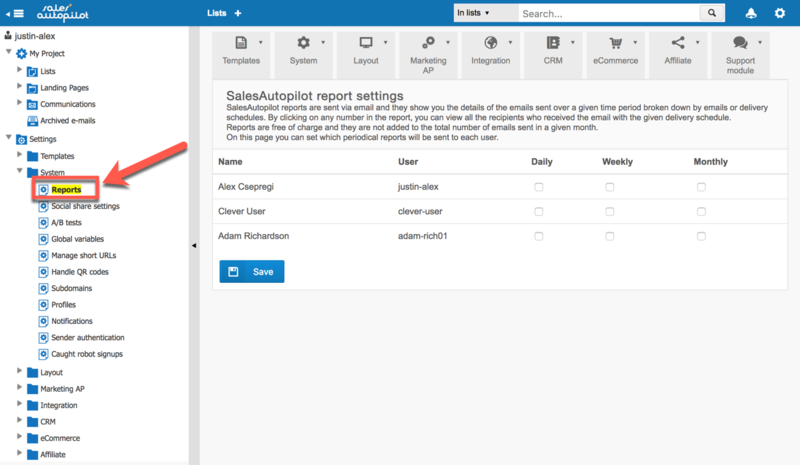 Check the appropriate box (daily/weekly/monthly) for the users you want to send SalesAutopilot reports to. If you would like to send a report to someone who is not on the list, you can create a new user by going to the Admin Console, as shown in the picture below. The reports can be sent to users who don't have permission to log in to the software. Every report includes the recipient's name and information about who else received it. SalesAutopilot reports are not added to the total number of emails sent, like other administrative notifications, so they are free of charge. 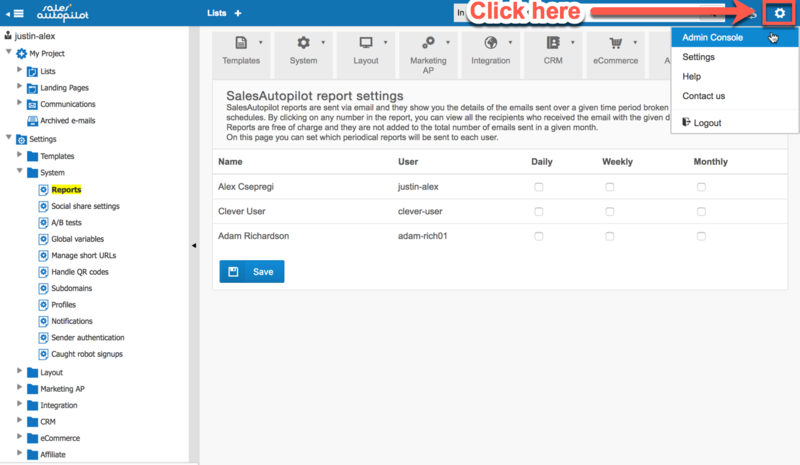 Reports will be sent to the email address of the user recorded in SalesAutopilot. If you do not receive the report, double check the email address recorded in SalesAutopilot to see if it's the one you want to send the report to. If it is, then check your spam folder. You will see three tables in daily reports, and two in weekly and monthly reports. The first table contains the lists that had at least one new subscriber over the given period, along with the number of single opt-ins, double opt-ins, double opt-in confirmations, and unsubscribes over the given period. The table DOES NOT contain the lists where all four of these values were zero. The second table contains some of the most important details of the emails sent to the given list and the number of sends for each email. If you click on the number of sends, you will be automatically logged into your SalesAutopilot account and have the subscribers who received the given email listed. You can view the history of particular recipients by clicking on their email address. This information will include when they subscribed to the list, which emails did they receive and when, when they opened their emails, when they clicked links in certain emails, when they updated their profile, and when they unsubscribed (if they did). You can edit the details of any subscriber. This list of subscribers - similar to how the subscribers of the list are normally listed - will only contain those fields of the list that you selected to be listed on the List fields page. You can view or edit every detail of a subscriber by clicking on the edit icon. The third table in the report is only included in daily SalesAutopilot reports. The only difference between this table and the second table is that it contains the emails sent between 0:00 am of that day and the time of the sending of the report, instead of the emails sends from the previous day. SalesAutopilot reports help you get a daily, weekly, and monthly overview of how many emails were sent to which lists and with which delivery schedules. This quickly gives you a comprehensive view of your email sends over a given period, and thus helps you save a significant amount of time on a regular basis.